This weekend promised to be packed with activity. Cheryl Potter was bringing a mystery guest to our hand dye class, and we had a hundred things to do to get the shop ready. The day started rather ominously when a truck full of garbage rolled over on the Interstate 93 ramp right outside of the shop, closing down the ramp and causing huge tailbacks. It was also pouring with rain and I don't think the state troopers or local police were too happy. Anyway we did get everything done and were ready for the hand dye class. 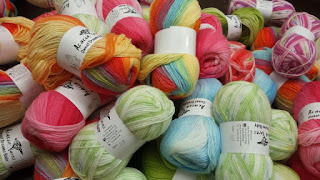 Cyndi, Gina and myself decided we were going to try hand dyeing cascade silk. Cyndi was going to use ours for shawls. Trains, Blankets and Finished Projects!